Joe Mackall has lived surrounded by the Swartzentruber Amish community of Ashland County, Ohio, for over sixteen years. They are the most traditional and insular of all the Amish sects: the Swartzentrubers live without gas, electricity, or indoor plumbing; without lights on their buggies or cushioned chairs in their homes; and without rumspringa, the recently popularized “running-around time” that some Amish sects allow their sixteen-year-olds. Over the years, Mackall has developed a steady relationship with the Shetler family (Samuel and Mary, their nine children, and their extended family). Plain Secrets tells the Shetlers’ story over these years, using their lives to paint a portrait of Swartzentruber Amish life and mores. During this time, Samuel’s nephew Jonas finally rejects the strictures of the Amish way of life for good, after two failed attempts to leave, and his bright young daughter reaches the end of school for Amish children: the eighth grade. But Plain Secrets is also the story of the unusual friendship between Samuel and Joe. Samuel is quietly bemused and, one suspects, secretly delighted at Joe’s ignorance of crops and planting, carpentry and cattle. He knows Joe is planning to write a book about the family, and yet he allows him a glimpse of the tensions inside this intensely private community. These and other stories from the life of the family reveal the larger questions posed by the Amish way of life. If the continued existence of the Amish in the midst of modern society asks us to consider the appeal of traditional, highly restrictive, and gendered religious communities, it also asks how we romanticize or condemn these communities and why. 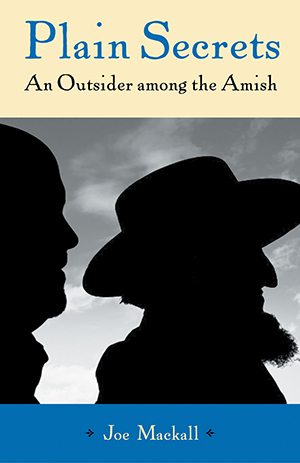 Mackall’s attempt to parse these questions to write as honestly as possible about what he has seen of Amish life tests his relationship with Samuel and reveals the limits of a friendship between “English” and Amish. For more information about the book, Joe Mackall, and the Swartzentruber Amish, please visit www.plainsecrets.com.